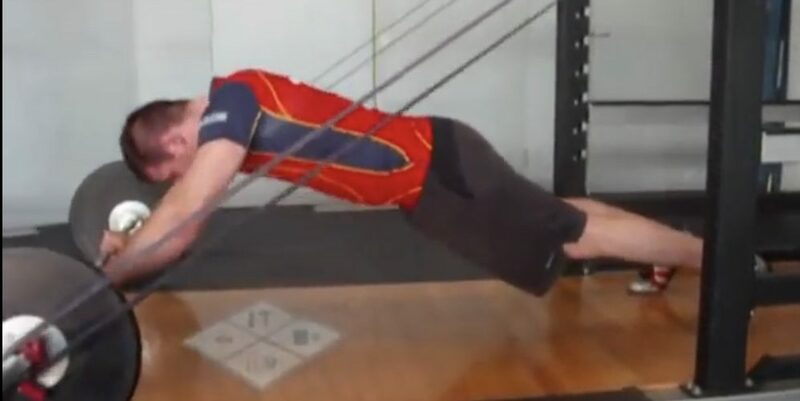 There’s a lot of dedicated gym goers that can move for 30 minutes training their abs directly, yet can’t hold the correct position in a plank for 30s due to a constant lumbar extension. Whilst there is nothing wrong with using muscular endurance parameters to train the core, there should be a sensible inward to outward approach. By this I mean, good activation of the TVA in a static position (plank or even regression) into more complex and dynamic positions (candlesticks/ roll-out variations etc). Rugby players can often end up with an anterior pelvic tilt due to all the squatting, deadlifting and sprinting to fatigue (and neglecting stretching and core work). Working on the anterior core will help contribute to fight against an anterior pelvic tilt posture and importantly, will allow for all the strength and power in the legs transfer more effectively through the body…Nobody is coaching players to make big hits with a Quasimodo position, right?! The core needs trained in all planes of movement and there are a multitude of exercises to chose from. That said, treat core training like other movements in a program; select a set exercise for a period of time (don’t randomly string together movements you fancy doing each time you train) and manipulate the volume/ intensity to improve, then modify the exercise to increase difficulty. Below are just two examples of progression sequences I’ve used with athletes for success with regards to anterior core development. An athlete will slot in at wherever their starting point is and nail the correct position with manipulated parameters before I move them on.